The FX3 was already a legend when its replacement, the FX4, was introduced in July 1958. No one would guess back then that the new London taxi would become even more famous than its predecessor, and that its lifespan would be close to four times longer. Still, there was nothing revolutionary about the FX4. On the contrary, this was an extremely conventional car, which used a chassis almost identical to the FX3’s one. Uncommon back then on European cars, but regarded as desirable on a taxi, the diesel engine and the automatic gearbox had already been pioneered by the FX3. 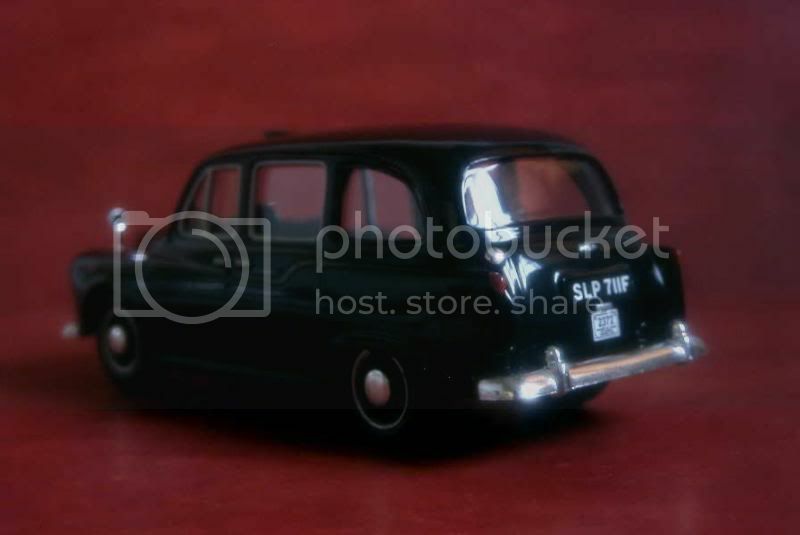 Another trademark of Austin’s cabs that had remained was the very small turning radius – a London taxi “turns on a sixpence”, as the saying goes. Actually this characteristic is made mandatory by the British capital’s public transport authorities. As the legend has it, this is originally due to the narrow path with tight corners leading to the entrance of the Savoy, the most prestigious palace hotel in London. Though the passenger compartment of the FX4, which body had been designed by Carbodies, can now be looke d as typical, it was then common in taxis from most European countries: the driver was separated from its customers by a divider, the absence of a seat near him allowed to carry bulky luggage, while additional passengers could take place on two jump seats. Designed as a very conventional vehicle as we have said, the FX4 changed little over the years. The only two conspicuous evolutions were the use of rear lights borrowed from the new ADO 16 for the sake of standardization (1968) and the replacement of the original 2.2-litre engine by a larger 2.5-litre (1971). A noteworthy trait of the car was that, due to its very long life expectancy (many FX4s’ milometers were able to approach two millions kilometres), older cars could generally be retrofitted with most small improvements later brought to the original car. As we mentioned every time we discuss a Seventies British car, the country’s automotive industry was struggling then simply to survive. Austin had much more important things to do than caring for the relatively low-volume FX4. Would the traditional London cab simply vanish, to be replaced by converted family saloons? Fortunately this didn’t happen: in 1982, it sold all its productions dies and intellectual rights to Carbodies. The small manufacturer faced a problem nonetheless: Austin simultaneously stopped the production of its diesel engine, so a new plant had to be found. Carbodies thought an ideal replacement would be the 2.3-litre block from the Land Rover. Unfortunately FX4s so equipped didn’t give satisfaction to their operators. In 1984, the FX4 saw yet another nameplate affixed onto it: LTI. 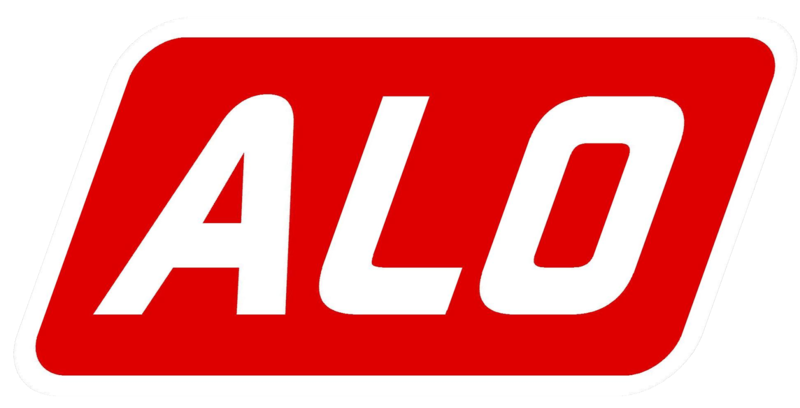 The new company, which name stands for London Taxis International, had been created by the merger of Carbodies and the major London cabs’ operator, both companies being under the same ownership. Soon LTI addressed the car’s engine problem by replacing the 2.3-litre by a 2.5-litre, also provided by Land Rover but distinctly sturdier. Nonetheless this still wasn’t enough and – a sign of changing times – LTI turned to a Japanese engine from 1989 on, namely a 2.7-litre Nissan diesel. This larger block not only improved reliability, but also gave higher performances, which prompted the need for a new disk brakes system. Under this latest guise, the FX4 carried on for ten more years, addressing as it could the multiplying environmental rules. 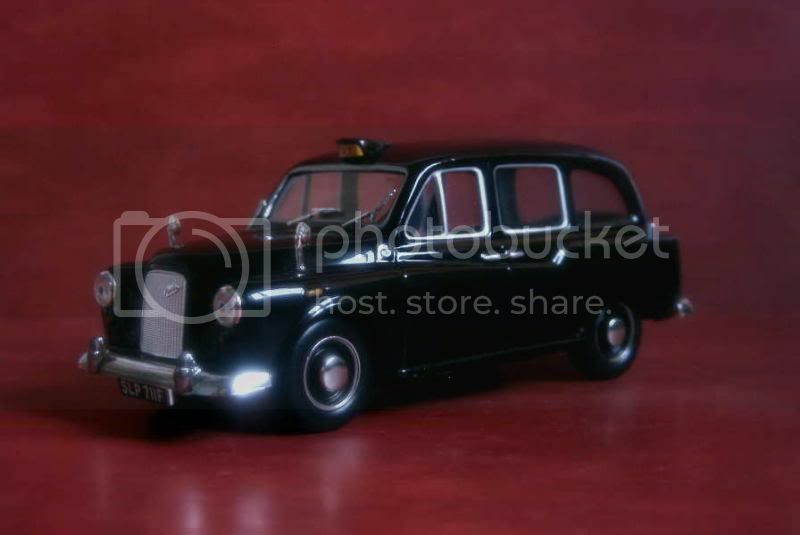 While prototypes for a replacement had been proposed since the Eighties by various manufacturers, it was finally LTI itself which provided the new London “black cab”, the TX, after the very last FX4 left the factory in October 1997. A die-cast I really wanted but had to wait for long before I put my hands onto one. No regrets when I opened the package: this is a nice model Ixo made. Nothing fancy (door handles and rear lights are moulded with the body then painted, for example), but correct all around. It's just a pity silver paint materializing the chromed rim around the windows has been applied to only five out of the car's eight windows - why? My rating is 12/20. 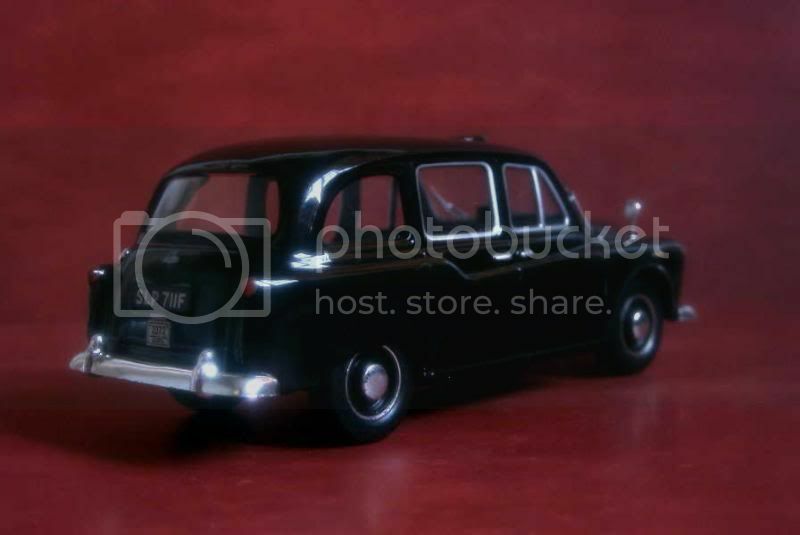 Today the FX4 remains the most iconic London taxi, and many second-hand vehicles have been exported, some for collectors, other for publicity purposes. 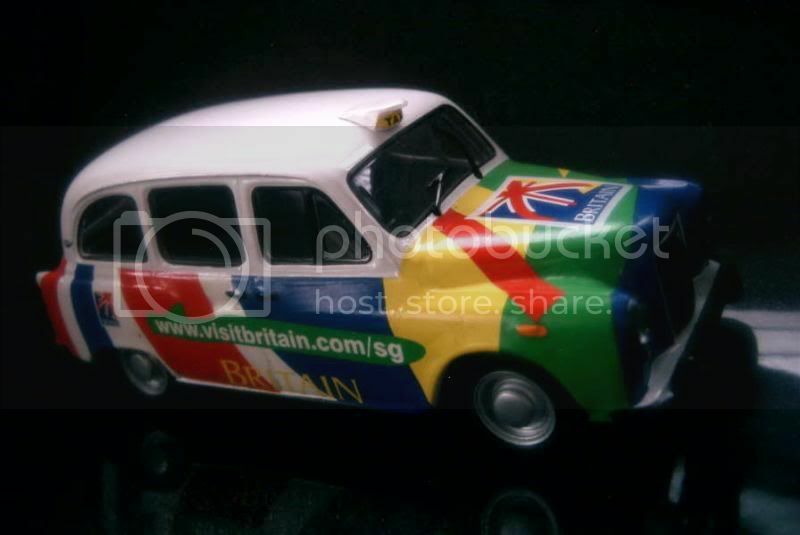 This is the case of this LTI, that can be approximately dated from the Nineties, and which Altaya chose to reproduce as a Singapore taxi - though probably authentic, not necessarily typical from the South-Asian metropolis. Anyway the model is original and... colourful! My main reproach is that though the model is recent (note the black grille, bumpers and door handles), unwilling to modify its mould Ixo kept the little round rear lights of the pre-1968 cars. This detail is nevertheless discreet so I'll still give 11/20 to it. Thank you very much interdomin! Thanks also to Tohmé, who let a nice message... which disappeared into thin air after I approved its publication. First time this happened. :( And for those who could suggest I mistakenly pressed the "delete" button, it isn't, as I approved both of these messages together. 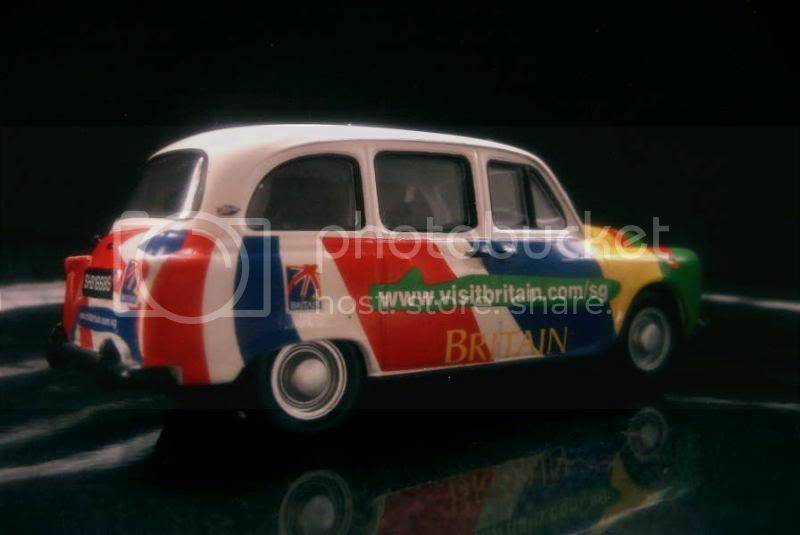 Uau, i love this britain taxi. And what do you know about de Corvette-Ferrari? I will find something about, ok? Thanks Tohmé for your comment, it's nice to have you here! Regarding the Ferrari-Corvette, I don't remember anything apart from its existence, so I'll have to make a few research. I'm not even sure that I've ever seen a picture of it, but it's true that I'm more into collecting race results than photos.